Shortly after Mimi (z”l) passed away, I started dating my very good friend, now known as The Dad. As he was Jewish, we both thought that our relationship would just be a bit of fun between two Toys R Us coworkers who got along really well. A few months into this fun foray into dating, I realized that I really, really liked The (future) Dad and didn’t want our religious differences to spell the end of a great relationship. So, while he was away at a friend’s wedding in New York, I went to the library and took out some books. I mean, up until that point, all I knew about Judaism was that they didn’t eat pork and didn’t celebrate Christmas. I could live without bacon (and if you’ve ever tasted bacon, you get the idea of how incredible The Dad is for me to even think something like that) and since my mom suffered her brain aneurysm on Christmas Day 2007, I was beyond ok never celebrating Christmas again. 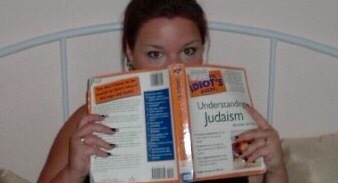 Let me tell you, there is a LOT more to Judaism than no piggy and no Jesus and no Christmas. There are mitzvot, laws (613 of them), dietary restrictions (that fall into both the mitzvah AND law category) and a whole other language (or 3, depending on how you look at things). Now, I obviously won’t get into what each law is or all of the mitzvot, but I will tell you that I was very overwhelmed. What was I thinking about getting myself into?! I now own this one AND I met the author!! I sat on my little secret for a couple of months. Once I was sure that The Dad was someone that I simply could not live without and I no longer felt scared to death about what I had decided to do, I told him my thoughts. Floored doesn’t even begin to describe his reaction. He must have asked if I was sure about a thousand times. Once he was convinced that this was something that I actually wanted to do, we started our research as to how one goes about conversion. There is a lot of information out there, let me tell you! Google is rich with knowledge and full of others who were looking to do the same thing or had already done it. The Shul we decided on would prove to have a greater impact on our lives than we ever could have imagined. We began attending in May 2009 and have been there ever since. My sponsoring Rabbi was the head Rabbi of the Shul, the (then) Chazzan Sheni and his (now) wife became like family to us and the friends we’ve made have been worth the price of “admission” alone. The Dad is now the Baal Koreh (he reads the Torah and leads services on Shabbat, holidays, stat holidays, etc.) and our kids are well-known around the building. We have a family of friends there and we have been lucky enough to get to know them and watch their families grow as well. I began my classes in August of 2009 and went before the Beit Din (the ‘court’ consisting of 3 Rabbis) in May 2010. I, obviously, met with their approval and went to the Mikveh later that day. I went in as Jennifer and came out as Nechama. It was a beautiful and emotional moment in my life and one I will remember for the rest of my life. There is nothing quite as spiritually beautiful as listening to the blessings being said to and repeated by me. I find Hebrew to be a beautiful language, but nothing will ever compare with how it felt to hear it that day. I converted Conservative, but we live a very Conservadox lifestyle. I won’t get into the debates about the differences between Orthodox, Conservative and Reform Judaism. I know what the writings say and how people feel about a conversion other than an Orthodox one. I converted not for acceptance, not to marry The Dad (though that was a pretty great bonus) and not to please anyone else but Hashem and myself. You see, had The Dad and I decided not to continue our relationship, I still would have gone through with my conversion. The decision that I made, the life that The Dad and I chose to lead and the way we raise our children is between us and Hashem. In one of the prayers it says to accept the righteous convert; not the Orthodox or Reform convert, but the righteous one. If I live a Jewish life to the best of my ability as a human being, then I think that I’m fulfilling that mitzvah and Hashem is hopefully pleased with my effort. I work every day to be accepted, to learn and to keep my conversion relatively quiet – lest our children be excluded or shunned for the choices their parents made. 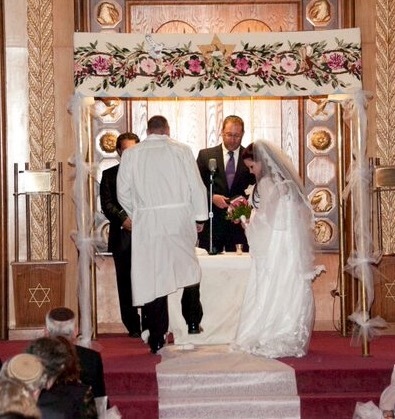 The Dad grew up in a Modern Orthodox home and has faced a lot of adversity and displeasure from his choice to marry me – a convert that is not, in most Orthodox Jews’ eyes, actually Jewish. As I said before, what others think is not nearly important to us as what Hashem thinks. Since I feel loved, blessed and Jewish, I’d like to think that Gd is ok with my decision. The breaking of the glass under the chuppah! Previous Post Red Rover, Red Rover, send THAT mommy over! So proud to be your friend…to watc our children grow up together as friends. You and your are one of my weekly highlights. I wish you didn’t have to keep the conversion “secret”. Acceptance should be unconditional. I am honoured to be a part of your life as well. Thank you for being you. I’m glad you shared a glimpse of your amazing journey. I hate…truly…the label of “convert” or even Baal teshuva. It unfairly labels a person and there are some in our remarkable faith that use these as grounds to alienate. Its a shame that it is taboo to talk about because actually it is the people who have converted or returned to Judaism that have the most to offer. I have only known you a relatively short time. I have enjoyed the time we have spent together and look forward to getting to know you more and more. You are a special person with a unique gift to write and tell your story. I wish that I had something equally as kind to say in turn, but your comment has brought tears to my eyes. I too am looking forward to spending more time together and watching our boys learn and grow. Having such understanding friends makes acceptance that much more achievable. Thank you. Truly. Welcome lantzman! You are the real deal. Thanks for sharing this. Much Mazel. Thank you. I am truly happy and where I believe I am meant to be. This is a beautiful story. Like many other people here I do not know much about the jewish faith, but I think its wonderful that you firstly met a man that made you want to do thst for and that secondly in going through the process you have found a way of life that works for you and makes you happy.